95 degrees air temp, 90%humidity, light breeze. I’ve never done a hotter race, although, ironically, the 2nd hottest was this race last year. Even with the brutal conditions this is one of my favorite races. Kristine and the kids love St Louis and when we arrived on Saturday, we met my cousin and his family for dinner. They were visiting St Louis as part of a trip for him to do a triathlon in Effingham, IL. After dinner we headed to the Forest Park and I rode for just under an hour while the kids played on one of the playgrounds. My legs felt terrible at first but by the time I had done a few harder efforts and gotten the blood flowing into them again after the long 9 hour drive from Birmingham, I was feeling good and ready for the race the next day. After the race we stayed one more night and spent about 5 hours exploring only a small part of the St Louis zoo — which is free!!! As far as the race went, it is definitely a race of survival. I made it into the front split of 20 with all the big names including four or five of the Jelly Belly pros. This was after a small break of 3 had already established itself. There were lots of attacks from within this chase group of 20, and I made it into a few of the breaks, but the rest of our group always came back up. Finally, an attack went that stuck leaving seven of us to try to finish the race ahead of the remnants of the pack. Unfortunately we were all cooked, so we couldn’t muster much more than 17-20mph. Even with a huge lead of close to 2 minutes over the remnants of the peloton, we got caught with about 5 to go. And in the field sprint, I could only manage 13th, for 27th overall. About 90 starters, only 50 finishers. Riding conservatively, staying towards the front but not going with any moves. Bridged to a good looking break here. This major drop in heartrate signifies the fact that our break wasn’t working well together so we sat up. The major split went at the beginning of this section. We were worked well together during the early part of the move. This increase in heart rate was from a series of attacks people started to launch from within the group. I made it into several of the moves but none of them worked. The drop in heartrate here is from missing the move that left our group. The rest of us that were left rode so easy that eventually the remnants of the pack caught up to us. Here is the final sprint, couldn’t even get back up to zone 5, completely exhausted. 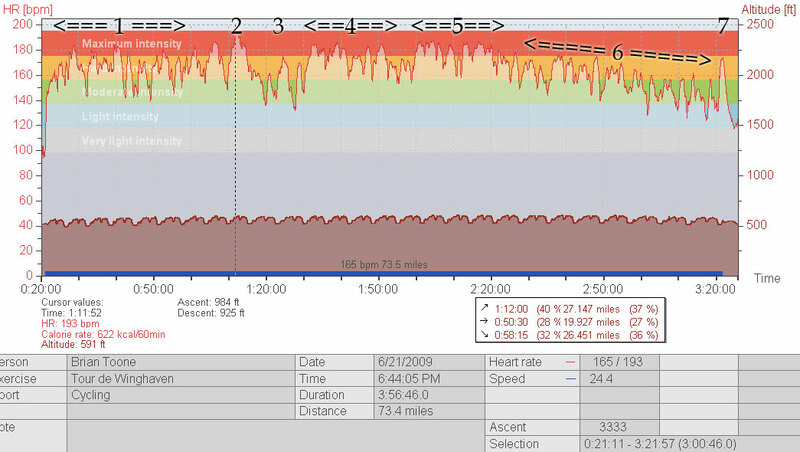 This entry was posted in Racing and tagged circuit race, heartrate, nrc on June 24, 2009 by kartoone.